This is everything. With all the meme messages out there, you might feel like you just can’t. Thank you for always pointing out that we have the ability to continue on our paths even when something else comes up to change that path a bit. So important to remember this. It’s the journey. Thanks for this perspective. My mind wanders all the time, not just when I try to meditate. 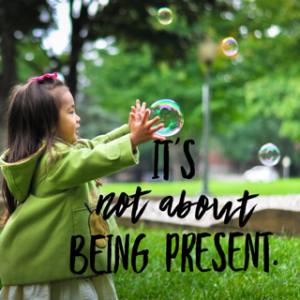 When I read about being present or meditating I felt like something was wrong with me because I couldn’t clear or quiet my head. Finally, someone explained to me it wasn’t about quieting the mind but bringing it back to the present or your meditation that matters. It’s nice to cut ourselves some slack and realize wandering is what our minds do. I’m glad you enjoyed that. I missed your simple wisdom, Debra. Hello beautiful, I always feel in the flow with “being present”. It’s not a place or a destination. It’s a journey, like life, ever-changing. Helen, I’m so glad to hear that took a load off of you. We can all use a break eh? Thanks so much for your kind words. I’m touched.